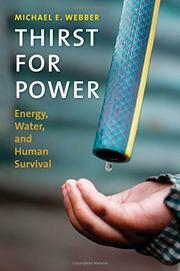 An exploration of the link between impending global water and power shortages. As Webber (Mechanical Engineering/Univ. of Texas; Changing the Way America Thinks About Energy: A Compendium of Commentary, 2009 etc. ), deputy director of the Energy Institute at the University of Texas, notes, “1.1 billion people [lack] access to clean water sources for drinking, cooking, and washing.” Meeting their needs is a pressing public health problem, he writes, but delivering that access “will require a lot of energy for treatment and transport to where it is needed.” In the author's view, “the grand challenge” of this century is providing “clean water, indoor lighting, [and a] comfortable way of life to every global citizen.” However, accomplishing this without irreversibly affecting the environment will be extremely difficult. With the use of satellite imagery in the past 15 years, it has become possible to estimate changes in the amount of groundwater globally. Unfortunately, writes Webber, “the amount of water in our bank account” is decreasing at an alarming rate. Satellite tracking reveals serious depletion of aquifers in India. Large dams such as the Three Gorges Dam in China are beneficial for controlling floods, providing irrigation for crops, and providing sources of hydroelectric power, but they also damage the local ecology, flood fertile land, and displace human and fish populations. Alternative and nuclear energies are attractive options to replace petroleum, but their use of water must also be considered. Throughout the book, Webber provides examples of the complexity of the issues at hand—e.g. growing corn, which needs irrigation, as a biofuel. The author proposes more sophisticated methods for recycling water, with different standards for purity depending on end use—e.g., separating the delivery for drinking water and sanitation and for industrial processes and irrigation. A wide-ranging, nuanced view of difficult but important issues that require serious consideration at every level, from policymakers, opinion shapers, and educators down to everyday citizens.